By the 1960s, Cai Luong had updated itself again. Now the vọng cổ sections were surrounded by Western pop styled intros and outros, from light swing to twangy rock, called tân cổ giao duyên (new and old songs of predestined affinity). On this record you can even hear the traditional instruments overlapping with the pop arrangement near the end. The song title is Một chiều gặp gỡ – An Afternoon Encounter. Nhật Hạ (a pseudonym for the songwriter Khánh Băng) wrote the tân nhạc (modern music). The female vocal is by Thanh Nga, an idol of the cải lương stage and cinema in the South. The male vocal is Thành Được, a popular cải lương actor. Văn Vĩ plays the lục huyền cầm (literally 6 string instrument, guitar, in this case with scalloped out frets). 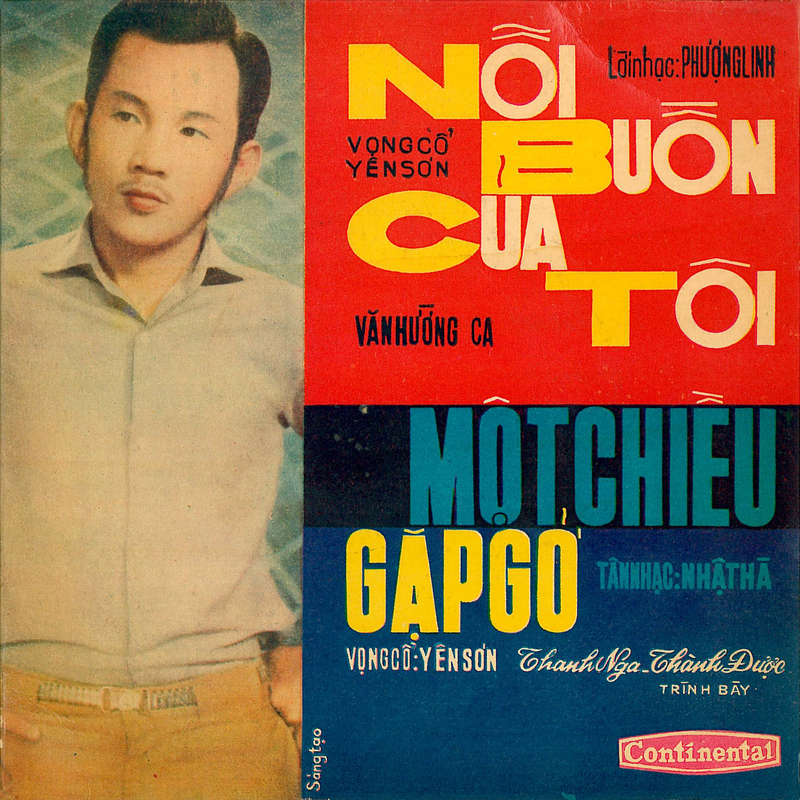 Yên Sơn wrote the vọng cổ (lyrics that fit the skeletal melody). Thanks to Stuart from Radio Diffusion Internasionaal for hooking me up with this record. He’s got a great guest post at Excavated Shellac right now that’s worth checking out. And another big ‘thank you’ to Vietnamese music researcher Jason Gibbs for his continuing help with translation and more. Vietnamese popular music is Jason’s main focus, with any luck we’ll hear more from him on the subject. This has to be one of the most unexpected and surprising records I’ve ever heard. And what a great description – “new and old songs of predestined affinity”. Perfect. And thanks again for selling me the 78 that I used for the post at Excavated Shellac! I still regret selling this record, but at least it ended up in the right hands. Hah! I KNEW that Van Shipley record sounded familiar! I’m glad you put it to good use. Glad you liked it Gracenotes…maybe I’ll post another, they’re all great.